You are at:Home»Herbs»Iris germanica Linn. 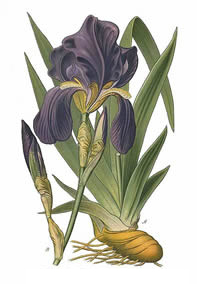 Latin name : Iris germanica Linn. Description : The root has anticonvulsant, antiinflammatory, cathartic, demulcent, deobstruent, diuretic, emetic and expectorant properties. Useful in bronchitis, colds, coughs, colic, sinusitis, chronic diarrhoea, laryngitis, headache, sore throat and oedema. Recommended Dosage : 5 to 7 g powder of dried root. Contraindication : Do not use this herb in conjunction with prescription diuretics.